I got into more detail about my top brands in this post, and they haven't changed - Essie and the very affordable Sinful Colors - still top my list. So this time around I'm focusing more on the shades themselves (although I do own/have used each of these and can vouch for the quality of each in addition to the color). The picks you see above showcase some of this fall's trends for polishes, like the dusty green shade in #1, and the bright cherry red in #7. But trends aside, the simple reason for which I use these particular colors is that most are slightly darker than summer shades giving them a cooler weather vibe, but they're still a little unconventional for fall. I tend to gravitate toward funkier colors (which you may have figured out by now by the red hue of my hair - i.e. one that is not found in nature), so you'll usually see me in green or blue polishes over, say, a more traditional fall burgundy tone. 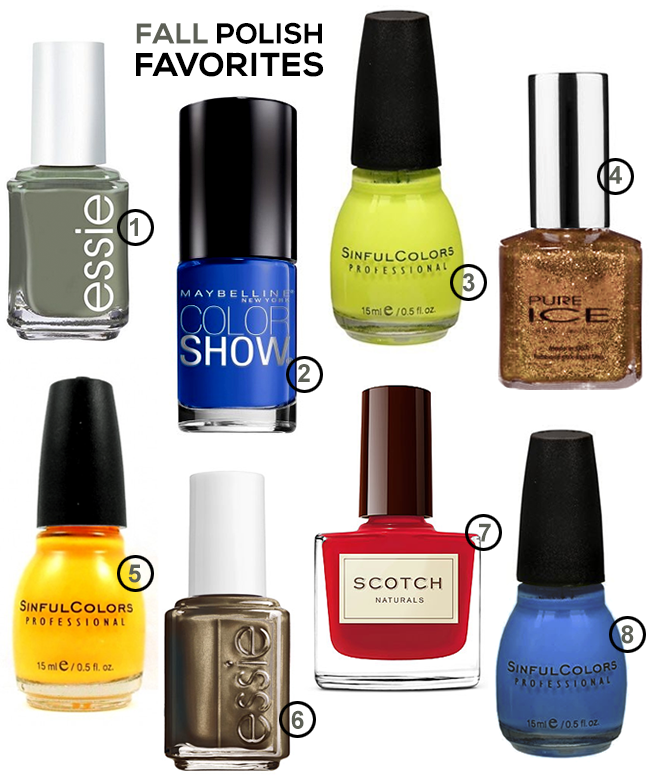 Thank you to Morgan for sharing her top fall nail polish picks! In addition to posting about her regular favorites, tips, and tutorials as Bubby & Bean's Beauty Contributor, Morgan is a high school Psychology and Sociology teacher, who, in her free time, can be found gardening, cooking (you can see some of her recipes here), drinking wine, or moonlighting as an amateur makeup artist. Red. I love this traditional colour in the colder months! I'm into funkier colors too and love both those Essie's for fall! Yes to a halloween or holiday nail tutorial please!!!! LOVE 3 and 5, they're perfect for Halloween! But I do love those gray/silver shades! Shades 6 and 7 would both be beautiful additions to my polish collection. Currently I'm wearing a purple shade from OPI - I chose it to coordinate with the colours of a wedding I was in over the weekend, but have found that I'm surprisingly fond of it and am looking for more deep purples this season. Love wearing reds, blacks, and glitters. Don't have a favorite brand yet. Love both the blues you featured in this post!